Congratulations to Prudenciana Cruz, director of the National Library, for being named one of the Outstanding Boholanos Around the World for 2006! The brief biography below is a slightly edited version of "Global search for outstanding Boholanos capped" (Bohol Chronicle, 30 July 2006). Prudenciana Cruz is the director of the National Library of the Philippines. Born in Albur, Bohol in l943, she obtained her degree in library science from University of San Carlos, her Masters in Library Science from the University of the Philippines, her post graduate studies in library and information science from the Northern Illinois University in the USA. 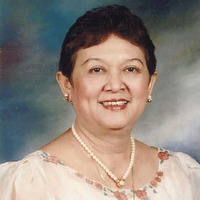 Cruz served as chief librarian of then Divine Word College-Tagbilaran from l964 to l970. In l970, she joined government service as provincial librarian of the Bohol Provincial library, and rose from the ranks in the National Library and was appointed director in 200l. Cruz has served as a resource person on library science, here and abroad, and has worked hard towards the improvement of the public library systems in the country, making them accessible to the general public, and empowering Filipinos through books and libraries. The photo is from the Consal XIII website. Visit this site for the most complete list of what's currently showing and what's coming soon, so that you can plan accordingly. It's just too bad that I won't be around when A Chorus Line, Les Miserables, and Mary Poppins open. The Fantasticks started previews tonight, but the tickets are too expensive for previews of an Off-Broadway show that I saw in its original incarnation. And did you know that Legally Blonde will be a musical by next year? 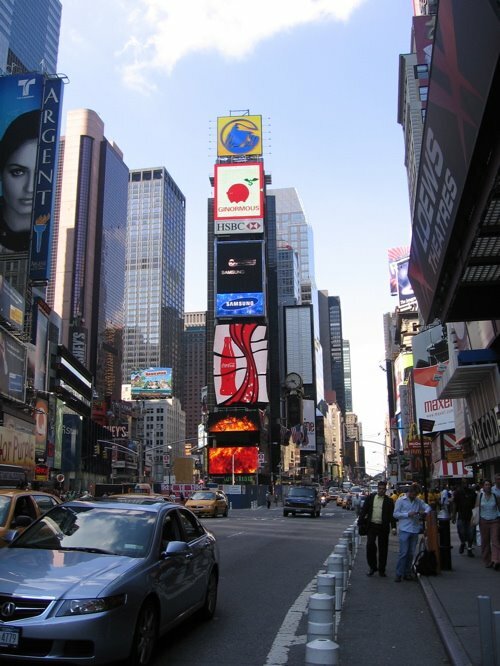 Provides the basics (i.e., address, sked) for most Broadway shows and info on availability of "rush" and "SRO" tickets. These tickets are sold only on the day of the performance, and may not always be available. Rush tickets are usually for front-row seats where you will most likely not be able to see the entire stage, but you will see the actors up close. SRO tickets are for designated spaces at the back of the orchestra or mezzanine. Prices for rush/SRO tickets range from $20 to $25. Policies vary per show. See the FAQ for more information. The name is a misnomer but the site has a table that shows the availability of discount codes and rush/SRO tickets. You may want to buy access to their Discount Broadway Ticket Guide ($4), but once you know what's available for which show, you can just head over to BroadwayBox.com for the codes, or Talkin Broadway for the rush/SRO info. TKTS has half-price tickets for reasonably good seats, but the cheapest tickets for the best seats in the house, in my opinion, are the rush tickets. Go to the sites I mentioned above, but it's also good to visit the theaters and ask at the box office because policies may have changed since the sites were last updated. To find out where the theaters are, go to the Times Square Information Center and get the print copy of the free map of theaters. Finally, if you're going to see more than one show, I suggest that you take some time to do some research on the musicals you'd like to see, and visit TKTS and a few theaters to get a feel for the kind of lines and/or lotteries you'll be encountering. Break a leg! As the nursing board exam scandal continues to make headlines—even meriting an Inquirer editorial on "Honor"—I thought of sharing the video of a speech I delivered when I took my oath as a licensed librarian in 2004. It was not luck, but a lot of hard work—whether in the weeks before the exam, months of attending classes while working at the same time, or years of being a library assistant and attending to the needs of husbands, wives and children. We did not win the lottery. We did not get lucky. We deserve to be here. Read the full text of my speech here. Let's hope that it doesn't erupt, but if you'd like to know the latest updates, check out the following: Google News, Yahoo! News (see also images), and Topix.net. You may also wish to keep your eyes on the websites of the National Disaster Coordinating Council (NDCC) and Philippine Institute of Volcanology and Seismology (PHIVOLCS), which includes information on the physical characteristics of Mayon Volcano and even the populations of the municipalities around it. There is also a list of all active volcanoes in the Philippines. 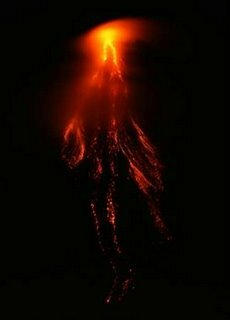 Finally, try to remember that there are human beings around the volcano, who may not necessarily flee for various reasons. Some have actually traveled to Albay because of Mayon's impending eruption. As Minette of A Wonderful Life says, "It's really such a spectacular sight when you get to see it up close especially at night. I watched, just like the other locals and tourists, mesmerized by its beauty and oblivious to the danger it poses." The plagiarist left a comment. I'm not going to react to everything he says because it's not worth it, but take a look at these: "maybe it would have been better if you'd asked..." and "...viewing a positively committed mistake as a negative is worse than committing plagiarism as admitted." Ok, I apologize. I was wrong. I should have asked for permission before making the conclusion that what was published on another blog with no attribution to the original author was plagiarism. But wait! Isn't asking for permission what he should have done in the first place? What's going on?!!! It really wasn't a big deal to me. It wasn't even a very important post for which I'd like to be acknowledged. I was just going to mention it once and let it go. But no, he had to give a lecture on ethics. And please note, the word "sorry" never appears in his comment. I don't know what email he's talking about, either. I've gone on Broadway binges before, and both times, I bought most of my tickets at TKTS, where you can buy tickets at half-price (or 3/4 price, in some cases), but you can get them only a few hours before the show and you'll have to accept whatever seats they give you. AND you'll most likely have to line up for a few hours, too. 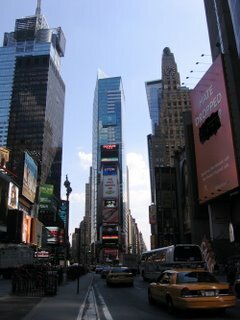 I was able to get a few tickets at 40 percent off before because I got some coupons while walking around Times Square. But I've been looking for them on this trip, and it looks like they're better hidden now or they're not given away anymore. The coupons, I think, have been digitized. A cousin who works in New York City sent me a pdf file of special offers with promo codes, which I printed out and used to buy tickets yesterday at about 40 percent off. 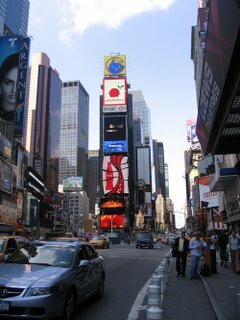 If you don't know anyone who can get you these offers that are not known to many tourists, check out BroadwayBox.com, which offers practically the same prices for the same shows. The tickets may be more expensive than what you can get at TKTS by about 10 percent, but you won't have to stand in line, you can buy your tickets in advance AND you can choose the best seats available. You can order online or buy them at the box office as long as you have the promo code. And that's why I have yet to buy a ticket at full price or at TKTS. And then there were what Rickey has called "very cheap tickets to a matinee of Wicked. The tickets were $25 each, and not just for matinees. I'd gotten such tickets before through word of mouth or by looking at the fine print around the box office windows of sold-out shows. Some were standing-room tickets, while others were for front-row seats. I had to line up early to get those tickets, and in one case had to wait several hours with Rent groupies to get the front-row seats. But not anymore. You can get lucky, too. Visit the websites of Wicked and Rent, and see if you can find the almost-invisible information for the lotteries. You may also wish to visit the theaters in person because some, like Spelling Bee, don't post the lottery information on their websites. If you're rich enough to buy tickets at full price and just need resources to identify what you should watch, check out the Tony Award winners, if you'd like to just stick with the shows that have won it in the past, and the New York Times reviews of what's currently showing—because while there are quite a few reviewers, a show isn't really a hit until the Times says it is. Sometimes, you find out what people say about you because they blog about you. And sometimes they write about you on the same day! Then there's Melchor Cichon who featured me in Fisheries Librarian, his new blog. Much of his post is based on what I've written in the past or answers to questions that he emailed to me—because we've never met. This part is interesting: "Von, as he is fondly called by his friends, has elevated further the library profession in the Philippines by bringing closer the Filipino librarians to the world of the internet." I suppose he was exercising his poetic license, but I hope that, somehow, what he wrote will be true even for a few. And just in case some of you think that I am a veteran librarian with a lot of experience under my belt, I'll just quote what he quoted from what I wrote (that rhymes! ): "i haven't really been officially a librarian since i graduated and got my license in 2004... except on the blog. it's really ironic." I've never been employed as a librarian. I worked in a library after graduation, but I was a records assistant. And then I taught at the University of the Philippines. But because of this blog, more people probably know me as "Filipino Librarian." 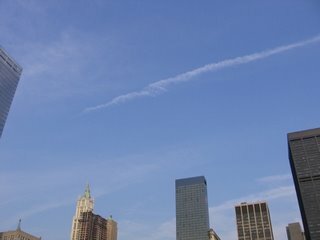 The photo above is not really of the sky, but of the space where the World Trade Center towers should have been. The photo below will give an idea of the space the towers occupied—several blocks, in fact. NOTE (10 September 2011): The links below don't work anymore. Please see "9/11 Obituaries" for more information. See also the New York Times and CNN for obituaries and other tributes to all those who died not just at the towers, but other locations/planes, too. You may also wish to participate in the September Project, a library-based "grassroots effort to get people together on September 11th to talk about issues that matter," or its more "local" equivalent (see "Remembering 9/11"). Finally, there are the movies United 93, which has already premiered, and World Trade Center, which will be opening soon. Some bloggers are too busy trying to make money that they don't even bother to check out the basics when they plagiarize. I don't know whether to be angry that my writing style was copied in toto (!) without any attribution, or to laugh my head off because the post that was copied—and passed off as current information—was for last year! Check out my post entitled "Events" and then see "Philippine Blogging Community Events" in the plagiarist's "The Latest Events in SEO, SEM, Outsourcing and the Blogging Community." If he got this wrong, what else has he gotten wrong? Or plagiarized? "High tide or low tide?" was the reply given by Charlene Gonzales to a question asked at the finals of the Miss Universe pageant held in Manila in 1994. It's not clear whether the host realized that Gonzales was joking, so she then had to say that there are 7,107 islands at high tide, and 7,108 at low tide, which was not necessarily correct. Watch the interview on YouTube. The official number, according to the Department of Tourism, is 7,107, which is what Filipinos have been taught for a long time. But don't go looking for a list of all these islands because many of them don't have names, and only a few hundred are inhabited. And yes, some are so small that they (dis)appear with the tides. 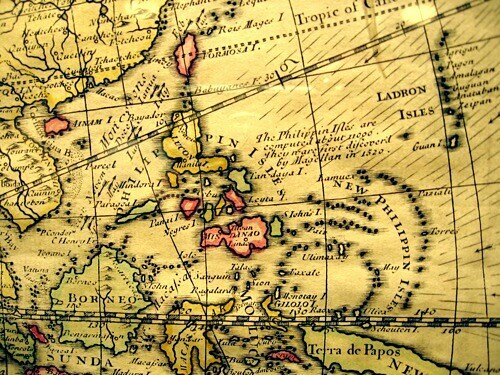 According to a map from the 1700s, "The Philippine Isles are computed to be 11000. They ware first discover'd by Magellan in 1520." There are obvious errors right there, but let's focus on the number of islands. Could it be that the mapmaker was wrong, just giving an estimate, repeating a figure handed down to him, or did the Philippines really have more islands then? Look carefully at the image above, and try to figure out where the "New Philippine Isles" might be today. Note: The photo above was taken by this blograrian from a map on exhibit at the Boston Public Library, 21 July 2006. In the next few days, this blog will have a few more posts than usual about what I'm doing. But don't worry, it's not going to be anything serious. Take the photos above. No Vanilla Sky reference there. They just happen to be the two towers surrounding the place that this Broadway junkie has come to know very well: the TKTS booth, where tickets to Broadway shows are sold at half-price. We were classmates for eight years. Rickey Yaneza was already a pop culture junkie even then. But who could've known that, 25 years later, we would meet again several oceans away from where we first met? He was always last on the class list then, but now he's always first on Pinoy Top Blogs. The photo on the right was my idea, and gives you an idea how obvious I can get. Rickey, after all, is not just known for writing about "American Idol" at Rickey.org. He's also written more posts about "StarStruck" on Pinoy Rickey than any other show. Rickey is wearing a Monday shirt because, of course, we met on a Monday. Quotable quote about his A-list blogger status: "I was lucky to find an audience that was willing to read what I wrote." "More 'e-libraries' set in Quezon City" by DJ Yap (Philippine Daily Inquirer, 24 June 2006) sounds like good news. And it is good, it's just not "news" to me. My thesis focused on two of Quezon City's 11 SB e-Libraries (see "Money and Leadership"). One of the appendices in my thesis listed the 22 expansion schools. That was in 2004. Two years later, we get a press release saying that the city government will do what they said they would do two years ago. And again, no librarians' names are even mentioned. But don't mind me, I'm just grousing. It's a great project. Go, Quezon City, go! In a few hours, President Gloria Macapagal-Arroyo will be delivering her sixth State of the Nation Address (SONA) on a literally stormy day. You may wish to monitor developments through the new INQ7.net page devoted to the SONA (I linked to the old one last year) or watch it on GMANews.TV. 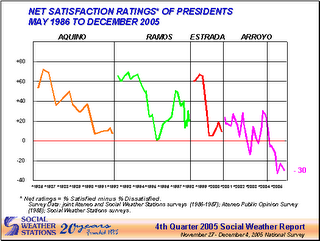 The graph below shows that the current president's net satisfaction ratings have been less than satisfactory compared with all previous presidents since 1986. And since all the other indicators are shown in connection with the sitting president, there is a strong temptation to come up with cause-and-effect relationships, which may or may not be the case. More data that can (in)validate hypotheses are available at the SWS Survey Data Library. PulseAsia also makes highlights of its Ulat ng Bayan Survey available online, but not in a way that makes it possible to compare data across decades or presidencies. Slicked-back hair, bulging muscles, leather jacket, jeans and shades—that's Arnold Zafra, a cataloger, dancing a la John Travolta to "Staying Alive." The title of the video is "John and the Marshas," a reference to an old Filipino TV sitcom about "John en Marsha," where John was always feuding with Marsha's mother. More than six months after Marlon Lacsamana filed a criminal case against Miriam College (see "Gay Librarian Sues Employer"), the prosecutor's office dismissed the case because the matter is still pending before the National Labor Relations Commission (NLRC). It is not clear, based on "Gay discrimination suit vs. Miriam dismissed" by Nancy Carvajal (Philippine Daily Inquirer, 5 July 2006), whether the prosecutor will, in fact, pursue the case if the NLRC rules that Miriam College is liable for illegal dismissal. But if you take a look at the NLRC's accomplishment report (pdf), while the number of cases disposed of every year has increased, the percentage of cases has only improved slightly. So it will probably take a long while before another update on Lacsamana's case is forthcoming. Google is not the enemy, contrary to what some people imply. In fact, just like most people, librarians find Google useful, too. Click on the "play" button above, or watch it on Google Video. You may also want to check out "Librarians and Tips of the Trade" for other stories of librarians using Google, and "Google at the 2006 American Library Association Conference," where librarians comment on Google's usefulness. Google may not have done it intentionally, but I believe it deserves credit for showing that not all librarians are cranky, old maids. Many Americans I've met since I arrived in the United States last month have been surprised that I speak English so well for someone who just got here. Well, I had to tell quite a few that English is the medium of instruction in Filipino schools. What I neglected to mention was that many of us grew up with American TV shows. And now that AOL is going the way of Google (see "Will AOL Finally Go Free? "), we can go back in time by watching many of the TV shows from which we learned English and American culture—for free!—on In2TV, the "first broadband network" with the "largest collection of free TV shows anywhere on the web. Not just highlights or listings, but full-length TV episodes." The lists of primary and secondary schools may be searched by region, division, school type and even keyword. Clicking on "view info" will show basic contact details, plus enrollment per grade/year level according to gender as of SY 2002-2003. The lists may also be downloaded as Excel files. In fact, until 2004, this was the only option available. Sometime during the last two years, despite the constant musical chairs at DepEd, some good was accomplished. If you'd just like to visit school websites, the best alternative, though not complete, is the Open Directory Project's list of Colleges and Universities and the category on Education. This blogger is one of the category editors of the former. If you'd like to help improve the list, you may want to become an editor. This post is part of a series about Pinoy Top Blogs. All figures and lists are based on 29 June 2006 data. Previous posts: 1 2 3 4 5 6. Today is the first anniversary of Pinoy Top Blogs! In "Blogs as Filipiniana, Part I," I promised to come up with a collection development policy (CDP) for blogs in Part II. Well, this series of posts about Pinoy Top Blogs (PTB) to celebrate its first anniversary has provided a good chance for me to go bloghopping. 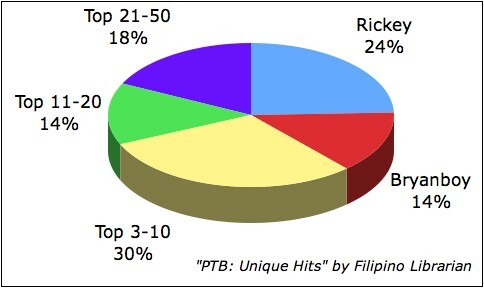 POP - Pop culture blogs make up more than 20 percent of the Top 50, but the more interesting fact is that on 29 June 2006, 50 percent of the Top 10, and 100 percent of the Top 3 (Rickey, BryanBoy and Retzwerx) were POP blogs! PER - It may be said that most of the PTB blogs are personal ones, but those classified here are the blogs where posts range from the "what I did today" kind to commentary on the state of the nation. In short, the owners write about just about anything. Only one of these (laurganism.com) is in the Top 10. IT - While the owners of the information technology blogs—and the rest of the Top 50—write about their personal lives, too, the IT blogs are predominantly about hardware, software and tech trends. In the case of sacha chua :: wiki, for instance, her personal life is so heavily IT that it wouldn't make sense to classify her blog under PER. BIZ - These blogs are either part of a business (eRadioportal, Weddings@Work.com, m|PH), or about a kind of business (EntrePinoy Atbp). 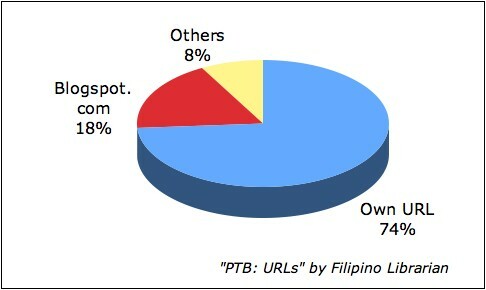 I included DigitalFilipino.com here even though its entry page is really more of a website and not a blog—because there are no posts arranged in reverse chronological order, no archives, no comments, etc., on the page being tracked by PTB. This is the same blog that I put under "Unknown" in the Frequency chart. POL - I suppose the political blogs could also be called journalists' blogs, but I think their popularity comes more from the political nature of the posts by the PCIJ reporters, Manuel L. Quezon III and Ellen Tordesillas. The difference between The Ca t's categories and my classification illustrates the subjectivity that goes with endeavors like this. The same is true of studies done by market research firms that use different methodologies, etc. The PTB Top 50 will not and cannot, of course, be the only basis for a blog CDP. There will be blogs whose owners will choose not to put the PTB code on their sites, blogs that will never make it to the Top 50 but will be useful as reference "materials," and blogs that do not seem important today but, who knows, will eventually be seen as the equivalent of the letters of Jose Rizal. And so, of course, the blog CDP will have to wait for another day. The word "mayabang"—which most Tagalog speakers would probably translate into English as "arrogant"—has "yabang" as its root word. So why is a campaign that aims to "unite the Filipino people in believing in themselves and in fellow Filipinos" called Yabang Pinoy? Well, probably because "ipagmalaki" (be proud) doesn't sound as catchy. Besides, taking a word like "yabang" with its negative connotation, and turning it into something positive, is representative of what the campaign aims to do with "Pinoy," the colloquial word for Filipino. While there are very few Filipinos who would deny that they are Pinoy, most—like me—would not be able to say that they are proud of what's going on in our country today, especially in government. And that, I guess, is why we need Yabang Pinoy. In "Brand Philippines," I asked, "could it be that Filipinos are less aware—or, perhaps, less proud—of their brand?" The people behind Yabang Pinoy, it seems, were thinking the same thing. Click on the image above to see how you can help promote pride in being Filipino. Better yet, buy the band and wear it! This post is part of a series about Pinoy Top Blogs. Previous posts: 1 2 3 4 5. All figures and lists are based on 29 June 2006 data. During the first week of July 2006, this blog zoomed up from the 40s to 13 (tip: click on the image above to see proof). Why? Pacquiao-Larios. This "accident" happened last January, too, to a lesser extent. Why? Pacquiao-Morales. It will, perhaps, be instructive to analyze how Pinoy Top Blogs (PTB) works in the context of what happens to this blog when Pacmania hits. This blog usually averages about 200 unique hits (UH) a day. Once in a while, I come up with a list of useful sites for an event that's about to happen. For both Pacquiao fights, I wrote my posts a week before the event. These did not cause much movement on this blog's stats, so I know it wasn't Pinoy Blog that drove the traffic. A week later, when Google and other search engines had already presumably indexed the relevant pages and interest in the fights was peaking, this blog had more than 900 UH over two days for the first fight, and 1,360 UH over two days after the second fight. These aren't much compared to the really big bloggers' daily UH, but it was enough to catapult this blog to a higher ranking, especially after the second fight on July 2, when the numbers on PTB had just been reset. This post is part of a series about Pinoy Top Blogs. Previous posts: 1 2 3 4. All figures and lists are based on 29 June 2006 data. Almost half of the blogs in the Top 50 are updated daily. Some are updated more than once a day, like Inside PCIJ, which is a group blog. But frequency of posting is, of course, unpredictable. Sometimes it depends on the political climate, the blogger's enthusiasm, or even the availability of a computer or Internet connection. What I found most surprising, however, was the fact that some blogs that are not updated very often ranked so high on the list. Splasher, 1001lives and Pinoy Pundit were not updated at all last June, but they were Top 16, 23 and 25, respectively, by 29 June 2006. Tomorrow, I'll go into the reason I started this in the first place: classification. I'll also explain why there is an "Unknown" in the Frequency chart. Updated 15 July 2006 to reflect the fact that one of the "Others" in the software chart is using a wiki. This post is part of a series about Pinoy Top Blogs. All figures and lists are based on 29 June 2006 data. Previous posts: 1 2 3. Almost 75 percent of the Top 50 blogs have their own uniform resource locator or URL (e.g., http://www.mine.com). The more technical term is "domain," and that costs money, which is what most of those who own the Top 50 blogs are spending. Blogs like this one, on the other hand, are hosted for free, but we do get not-so-attractive URLs (e.g., http://mine.blogspot.com). The "Others" shown in the chart below include two on prepys.com and one each on wordpress.com and i.ph. Another way of looking at this is by looking at the software used. Those on blogspot.com are, of course, using Blogger. It is possible to have your own URL and use Blogger at the same time, but I saw no evidence of this. Those classified under "Others" were using Movable Type, TypePad, Calliope, and a wiki. At least 60 percent of the Top 50 downloaded WordPress, which makes it really weird that, as Kates Gasis says, there was "No Wordpress in Digital Tour." I suspect that the blogs using "Unknown" software are also using WordPress, but I have no real evidence. Yup, librarians are putting up a concert. 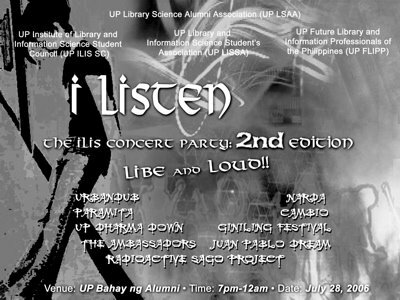 It's called "i Listen, the ILIS Concert Party: 2nd edition... Libe and Loud!!!" The bands performing are: Radioactive Sago Project, Cambio, Urbandub, Up Dharma Down, Narda, Giniling Festival, Juan Pablo Dream, Parampita, and The Ambassadors. The concert will be held at UP Bahay ng Alumni on Friday, 28 July 2006, 7pm-12mn. Tickets are P120 each. For more details, please call the Institute of Library and Information Science at 9818500 loc. 2869. The event is being presented by the UP Library Science Alumni Association, UP Institute of Library and Information Science Student Council, UP Library and Information Science Student Association, and UP Future Library and Information Professionals of the Philippines. You won't be needing your library card. Check it out! This post is part of a series about Pinoy Top Blogs. Previous posts: 1 2. All figures and lists are based on 29 June 2006 data. 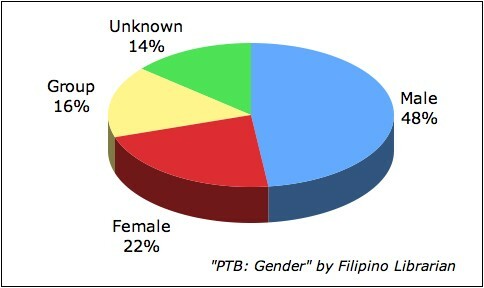 About half of the Top 50 blogs listed on Pinoy Top Blogs are owned by males, and most of the bloggers are based in the Philippines. It must be noted, though, that some bloggers did not disclose information about their gender or location. Or I simply wasn't able to find it. And since I am a male librarian, I chose not to inflict others' assumptions about me based on my profession on other bloggers. For instance, Lyle (Pinoy R.N.) sounds like a man's name, but since s/he's a nurse, I preferred to play it safe, and count him/her under "unknown." I also decided not to email anyone for more information, and looked at the blogs on an as-is-where-is basis. The charts pretty much speak for themselves, except that there are at least 7 blogs that are owned by only 3 bloggers. And so, it does not follow, for example, that if there are 24 blogs owned by males, then there are 24 unique male bloggers in the Top 50. In fact, the 5 overseas blogs owned by males are actually managed by only 3 individuals because Rickey and BatJay own 4 of the 5. Finally, the data here is very similar to the one found on Now What, Cat? 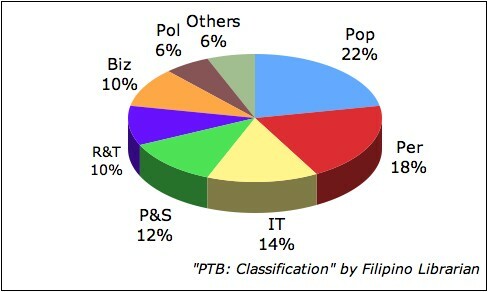 but that study looked at Technorati’s Philippine Top 100 Blogs. Today is the first anniversary of the Pinoy Teachers Network! Some of them are now teaching outside the Philippines. Others have retired or passed away. But some, like Onofre Pagsanghan at age 79, and those who received the Award for Continuing Excellence and Service, are still inspiring students and even other teachers. "Don't judge my brother, he's not a book!" That's what Melanie Marquez once said in defense of her brother. And no matter how much we say, "Don't judge a book by its cover," people who have no idea what a book is about will, in fact, start forming opinions about a book even before they touch it. Pantas Project Philippines (P3) understands this very well. That's why even though it could have gone the way of Project Gutenberg, the books available for download on its site are not just text files, but pdf files that can be printed easily. Plus, they have attractive covers, too. Arrival Speech by Benigno Aquino Jr. These materials may be downloaded for free, but CDs are also being distributed as part of the Nationwide Elibrary for Public High Schools (NEPHS) Project. If you would like to ensure that P3 achieves its goals, please see "There are many ways you can help." This post is part of a series that began with "Pinoy Top Blogs: Unique Hits." All figures and lists are based on 29 June 2006 data. 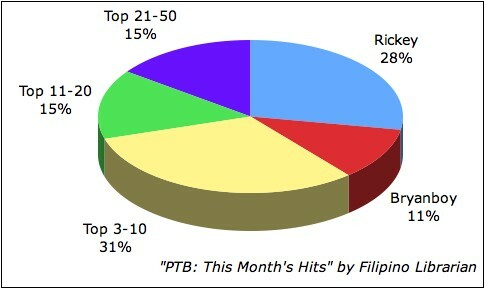 The pie chart for "This Month's Hits" is not much different from the one for Unique Hits. But this information is important for those who want to know whether visitors just passed by or stayed to read. "This Month's Hits" refers to the number of hits a blog receives, regardless of whether the visitor is unique or not. Another way of looking at it is by comparing the number of unique hits (UH) to the number of this month's hits (TMH). For instance, Pinoy Cook had "only" 56,746 UH, but totaled 261,934 TMH. This means that each UH on Pinoy Cook represents 4.62 TMH. In short, visitors are clicking more times on this blog than others. If you'd like to know why some blogs are more successful than others in terms of reader clicks, you may want to visit the TMH/UH Ratio Top 10. Some of them may not have as many hits as the UH Top 10, but they're very good at getting their readers to stay. A few, of course, appear on both lists. 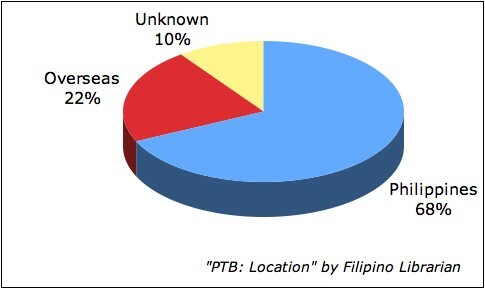 The following list was taken from Pinoy Top Blogs on 29 June 2006. Updated 10 July 2006 to include video on YouTube. The slideshow above was created using Flock (to upload the photos), Photobucket (to organize) and Rock You (to "animate" with captions). Unlike Flickr, the photos can't be tagged, but there are a few things that they can do that Flickr can't. To see all the photos without clicking on too many buttons, watch the slideshow or click on the arrow below. Updated 10 July 2006 to include raw data used. This post is part of a series about Pinoy Top Blogs. All figures and lists are based on 29 June 2006 data. Previous posts: 1 2 3 4 5 6 7. 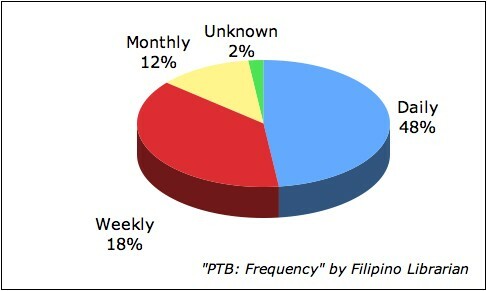 On 15 July 2006, Pinoy Top Blogs (PTB) will turn one year old. I never quite got around to doing the second part of "Blogs as Filipiniana, Part I," but I hope doing a series of posts about PTB will help me get around to Part II. a project to aggregate the most popular and most read blogs in the Philippine blogosphere and rank them according to the number of unique visitors they get on a monthly basis. More simply, it's a bestseller list. In the book industry, unique visits would count as sales, and instead of being updated weekly, the list is updated monthly. One difference between a bestseller list and PTB is that a blogger must choose to have his/her blogs included in the list. 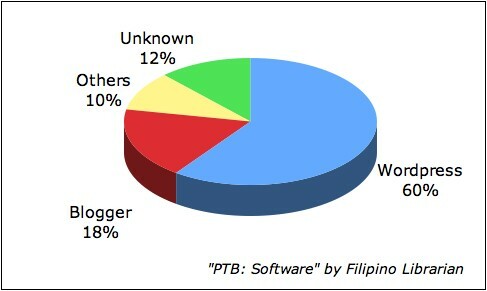 This is one reason why there are blogs that appear in Technorati’s Philippine Top 100 Blogs, but not on PTB. Due to the fact that PTB does not have an archive, the statistics that will be presented here will be based only on data as of 29 June 2006, the last day for which I was able to retrieve data from Google's cache. This study will also be limited to the Top 50. Let me start by looking at the unique hits, which certainly provide evidence that the Pareto principle (aka 80-20 rule) applies even to blogs. It is interesting that Rickey, by himself, accounts for about one-fourth of all unique hits in the Top 50. Along with Bryanboy, the Top 2 make up about 40 percent. Perhaps the fact that both of them seem to have predominantly non-Filipino readers (I know this about Rickey's audience, but I'm just guessing with Bryanboy) has a great deal to do with their very high stats. The Top 3-10 blogs account for 30 percent, while the Top 11-20, 14 percent. And the rest of the Top 50? Not even as much as Rickey's total. The lesson for bloggers who want to place higher on PTB? Try to write for the non-Filipino audience, too. Finally, to those who will inevitably ask, "What is so important about this list? Why analyze it at all?" This list is on the same level as INQ7's 10 most-read stories. In the greater scheme of things, it won't really change anything, but it will be important for a few people like advertisers and pop culture junkies who want to know what people are "buying." More on this in the next few days. I finally got around to arranging the two different translations in "The Philippine Declaration of Independence," to facilitate comparisons between the two. It must be noted, though, that the original was not divided into paragraphs, which is how the translation from John Taylor's Philippine Insurgent Records is presented. In this case, I have divided its text following the translation by Sulpicio Guevara. Melchor Cichon is the head librarian of the College of Fisheries and Ocean Sciences, University of the Philippines in the Visayas. He is also a poet, whose work has been recognized by the Unyon ng mga Manunulat sa Pilipinas, from which he received the Gawad Pambansang Alagad ni Balagtas in 2001. He has promoted Aklanon literature not just through his writing, but also by setting up a website. Now that blogging has become easier than managing a website, Cichon maintains several blogs including Events in My Life (personal), Dawn to Dawn (literary), and Profile of Filipino Fisheries Scientists (professional). For more information on Cichon, see his bio on Panitikan.com.ph, and "An Aklanon Poet" by Peter Solis Neri (Panay News, 1 March 2006). He has a photo on his blog, but it is, perhaps, more appropriate to share one of his poems. Click on the arrow above to watch the video, or watch it on YouTube. You may wish to press the “pause” button while waiting for the video to load. 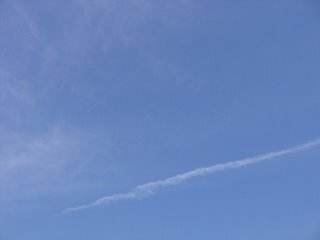 This video is composed of clips taken in Cambridge, MA, on 4 July 2006. A Canon PowerShot A510 digital camera was used to take the video. 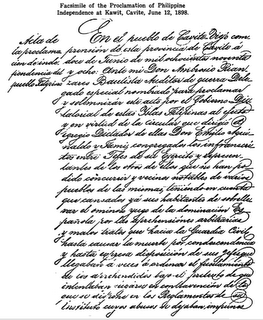 Click on the image above to see the first page of the Declaration of Independence handwritten by Ambrosio Rianzares Bautista, proclaimed in Kawit, Cavite, on 12 June 1898, and reproduced in The Laws of the First Philippine Republic: 1898-1899, compiled and edited by Sulpicio Guevara (Manila: National Historical Commission, 1972). See pp. 185-202 to see the entire document; signatures begin on p. 196. Below are (1) a translation made by Sulpicio Guevara (pp. 203-206), and (2) a translation from John Taylor's Philippine Insurgent Records, reprinted in The Development of Philippine Politics by Maximo Kalaw (Ph.D. dissertation, University of Michigan, ), pp. 413-417. Had resolved to start a revolution in August 1896 in order to regain the independence and sovereignty of which the people had been deprived by Spain through Governor Miguel Lopez de Legazpi who, continuing the course followed by his predecessor Ferdinand Magellan who landed on the shores of Cebu and occupied said Island by means of a Pact of Friendship with Chief Tupas, although he was killed in battle that took place in said shores to which battle he was provoked by Chief Kalipulako of Mactan who suspected his evil designs, landed on the Island of Bohol by entering also into a Blood Compact with its Chief Sikatuna, with the purpose of later taking by force the Island of Cebu, and because his successor Tupas did not allow him to occupy it, he went to Manila, the capital, winning likewise the friendship of its Chiefs Soliman and Lakandula, later taking possession of the city and the whole Archipelago in the name of Spain by virtue of an order of King Philip II, and with these historical precedents and because in international law the prescription established by law to legalize the vicious acquisition of private property is not recognized, the legitimacy of such revolution can not be put in doubt which was calmed but not completely stifled by the pacification proposed by Don Pedro A. Paterno with Don Emilio Aguinaldo as President of the Republic established in Biak-na-Bato and accepted by Governor-General Don Fernando Primo de Rivera under terms, both written and oral, among them being a general amnesty for all deported and convicted persons; that by reason of the non-fulfillment of some of the terms, after the destruction of the Spanish Squadron by the North American Navy, and bombardment of the plaza of Cavite, Don Emilio Aguinaldo returned in order to initiate a new revolution and no sooner had he given the order to rise on the 31st of last month when several towns anticipating the revolution, rose in revolt on the 28th, such that a Spanish contingent of 178 men, between Imus and Cavite-Viejo, under the command of a major of the Marine Infantry capitulated, the revolutionary movement spreading like wild fire to other towns of Cavite and the other provinces of Bataan, Pampanga, Batangas, Bulacan, Laguna, and Morong, some of them with seaports and such was the success of the victory of our arms, truly marvelous and without equal in the history of colonial revolutions that in the first mentioned province only the Detachments in Naic and Indang remained to surrender; in the second, all Detachments had been wiped out; in the third, the resistance of the Spanish forces was localized in the town of San Fernando where the greater part of them are concentrated, the remainder in Macabebe, Sexmoan, and Guagua; in the fourth, in the town of Lipa; in the fifth, in the capital and in Calumpit; and in the last two remaining provinces, only in their respective capitals, and the city of Manila will soon be besieged by our forces as well as the provinces of Nueva Ecija, Tarlac, Pangasinan, La Union, Zambales, and some others in the Visayas where the revolution at the time of the pacification and others even before, so that the independence of our country and the revindication of our sovereignty is assured. the people determined to start an insurrectionary movement in August, eighteen hundred and ninety-six, for the purpose of recovering the independence and sovereignty of which Spain deprived them through the Adelantado Miguel Lopez de Legaspi, who continuing the course followed by his predecessor Hernando de Magallanes, who arrived upon the shores of Cebu, and occupied that Island by virtue of the treaty of friendship which he celebrated with its King Tupas, although he was killed in the battle which took place on said shores, to which he was provoked by King Kalipulako de Maktan, who was suspicious of his bad intentions; he landed on the Island of Bohol, entering also into the celebrated blood compact of friendship with its King Sikatuna, for the purpose, after taking Cebu by force of arms, because the successor of Tupas did not permit him to occupy it, of coming to Manila, the capital, as he did, likewise winning the friendship of its Kings Soliman and Lakandula and afterwards taking possession of it and thus of the entire Archipelago for Spain, by virtue of an order of King Philip II; that in view of these historical data, because in international law the prescription established by laws legalizing even the fraudulent acquisition of the property of individuals is not recognized, there can be no doubt as to the legality of such a movement as the one that was quieted but not entirely quenched by the pacification proposed by Pedro A. Paterno with Don Emilio Aguinaldo as President of the Republican government established in Biac-na-bato, and accepted by the Governor-General, Don Fernando Primo de Rivera, under conditions which were established, some in writing and others verbally, among them a general amnesty for all deported and sentenced; that by reason of nonfulfillment of some of these conditions after the destruction of the Spanish squadron by the North American one and the bombardment of Cavite, Don Emilio Aguinaldo returned to start a new revolution, and hardly had he given the word to commence, on the thirty-first of last month, when several towns anticipated the movement, and on the twenty-eighth between Imus and Cavite Viejo here was engaged and captured force of one hundred and seventy-eight, commanded by a major of marine infantry. This movement spread like an electric spark through the other towns not only of this province, but also in Bataan, Pampanga, Batangas, Bulacan, Laguna and Morong, some of them with seaports. So complete is the triumph of our arms, truly marvelous and unparalleled in the history of Colonial revolutions, that in the first province mentioned there remain to be surrendered only the detachments at Naic and Indang; in the second there are none at all, in the third, resistance by the Spanish forces is localized in the town of San Fernando, where the greater part are concentrated the remainder being in Macabebe, Sesmoan and Guagua; in the fourth only in the city of Lipa; in the fifth, in the capital and Calumpit; and in the remaining two, only in their respective capitals. The city of Manila will soon be completely besieged by our forces, and also the posts in the province of Nueva Ecija, Tarlac, Pangasinan, Union, Zambales and several others in the Visayan islands, where insurrection has broken out in several of their towns, having started in some almost at the moment of completing that pacification, and in others even before that, wherefore the independence of our territory and the recovery of our sovereignty are assured. That they are and have the right to be free and independent; that they have ceased to have any allegiance to the Crown of Spain; that all political ties between them are and should be completely severed and annulled; and that, like other free and independent States, they enjoy the full power to make War and Peace, conclude commercial treaties, enter into alliances, regulate commerce, and do all other acts and things which an Independent State has a right to do, that they are and have the right to be free and independent; that they are released from all obedience to the crown of Spain; that every political tie between the two is and must be completely severed and annulled; and that, like all free and independent states, they have complete authority to make war, conclude peace, establish treaties of commerce, enter into alliances, regulate commerce, and execute all other acts and things that Independent States have the right to do. And imbued with firm confidence in Divine Providence, we hereby mutually bind ourselves to support this Declaration with our lives, our fortunes, and with our most sacred possession, our Honor. Reposing firm confidence in the protection of Divine Providence, we mutually pledge for the support of this declaration, our lives, our fortunes, and our most sacred possession, which is our honor. And in punishment for the impunity with which the Government sanctioned the commission of abuses by its officials, and for the unjust execution of Rizal and others who were sacrificed in order to please the insatiable friars in their hydropical thirst for vengeance against and extermination of all those who oppose their Machiavellian ends, trampling upon the Penal Code of these Islands, and of those suspected persons arrested by the Chiefs of Detachments at the instigation of the friars, without any form nor semblance of trial and without any spiritual aid of our sacred Religion; and likewise, and for the same ends, eminent Filipino priests, Doctor Don Jose Burgos, Don Mariano Gomez, and Don Jacinto Zamora were hanged whose innocent blood was shed due to the intrigues of these so-called Religious corporations which made the authorities to believe that the military uprising at the fort of San Felipe in Cavite on the night of January 21, 1872 was instigated by those Filipino martyrs, thereby impeding the execution of the decree-sentence issued by the Council of State in the appeal in the administrative case interposed by the secular clergy against the Royal Orders that directed that the parishes under them within the jurisdiction of this Bishopric be turned over to the Recollects in exchange for those controlled by them in Mindanao which were to be transferred to the Jesuits, thus revoking them completely and ordering the return of those parishes, all of which proceedings are on file with the Ministry of Foreign Affairs to which they are sent last month of last year for the issuance of the proper Royal Degree which, in turn, caused the growth of the tree of liberty in this our dear land that grew more and more through the iniquitous measures of oppression, until the last drop from our chalice of suffering having been drained, the first spark of revolution broke out in Caloocan, spread out to Santamesa and continued its course to the adjoining regions of the province where the unequalled heroism of its inhabitants fought a onesided battle against superior forces of General Blanco and General Polavieja for a period of three months, without proper arms nor ammunitions, except bolos, pointed bamboos, and arrows. in punishment of the impunity with which their Government allowed the commission of abuses by its subordinates; and for the unjust executions of said Rizal and others who were sacrificed to please the greedy body of friars in their insatiable desire to seek revenge upon and exterminate all those who are opposed to their Macchiavellian purposes, which tramples upon the penal code prescribed for these islands; and for the sake of those persons who, though merely suspected, were convicted by the Commanders of detachments at the instigation of the friars without form or semblance of a trial and without the spiritual consolation afforded by our sacred religion; and likewise for the hanging for the same motives of the eminent native Filipino priests Doctor Jose Burgos, Mariano Gomez and Jacinto Zamora, whose innocent blood was shed through the intrigues of those socalled religious orders which pretended that a military insurrection had broken out on the night of January 21st, 1872, in the Fort of San Felipe in the town of Cavite, accusing said martyrs of starting it, so as to prevent the execution of the decree-sentence issued by the Council of State in the appeal in administrative litigation (contencioso administrativo) interposed by the Secular Clergy against the Royal Orders where in it was directed that the parishes under them in the jurisdiction of this Archbishopic should be turned over to the Recoletos in exchange for those controlled by the Recoletos in Mindanao, which were to be transferred to the Jesuits. These were revoked completely, and the return of those parishes was ordered. The papers were filed in the Colonial Department, to which they were sent some time during the last months of the preceding year, for the preparation of the respective Royal Provision. That was what caused the tree of Liberty to bud in this land of ours, the iniquitous measures employed to suppress it only causing it to grow more and more, until, the last drop having been drained from the cup of our afflictions, the former insurrection broke out at Caloocan, extended to Santa Mesa, and continued its course to the adjoining places in this province, where the unequalled heroism of its inhabitants met with failure in the battles with General Blanco, and continued the struggle against the great hosts of General Polavieja for the period of three months, without any of the war material that we now possess, but commencing with arms peculiar to the country, such as the bolo, sharpened bamboo, and arrow. Moreover, we confer upon our famous Dictator Don Emilio Aguinaldo all the powers necessary to enable him to discharge the duties of Government, including the prerogatives of granting pardon and amnesty, Moreover we confer upon our renowned Dictator, Don Emilio Aguinaldo, all the powers necessary for the due administration of his Government, including the prerogatives of pardon and amnesty. And, lastly, it was resolved unanimously that this Nation, already free and independent as of this day, must use the same flag which up to now is being used, whose design and colors are found described in the attached drawing, the white triangle signifying the distinctive emblem of the famous Society of the "Katipunan" which by means of its blood compact inspired the masses to rise in revolution; the three stars, signifying the three principal Islands of this Archipelago-Luzon, Mindanao, and Panay where this revolutionary movement started; the sun representing the gigantic steps made by the sons of the country along the path of Progress and Civilization; the eight rays, signifying the eight provinces-Manila, Cavite, Bulacan, Pampanga, Nueva Ecija, Bataan, Laguna, and Batangas - which declared themselves in a state of war as soon as the first revolt was initiated; and the colors of Blue, Red, and White, commemorating the flag of the United States of North America, as a manifestation of our profound gratitude towards this Great Nation for its disinterested protection which it lent us and continues lending us. And finally, it was unanimously resolved that this Nation, independent from this day, must use the same flag used heretofore, whose design and colors and described in the accompanying drawing, with design representing in natural colors the three arms referred to. The white triangle represents the distinctive emblem of the famous Katipunan Society, which by means of its compact of blood urged on the masses of the people to insurrection; the three stars represent the three principal Islands of this Archipelago, Luzon, Mindanao and Panay, in which this insurrectionary movement broke out; the sun represents the gigantic strides that have been made by the sons of this land on the road of progress and civilization, its eight rays symbolizing the eight provinces of Manila, Cavite, Bulacan, Pampanga, Nueva Ecija, Bataan, Laguna and Batangas, which were declared in a state of war almost as soon as the first insurrectionary movement was initiated; and the colors blue, red and white, commemorate those of the flag of the United States of North America, in manifestation of our profound gratitude towards that Great Nation for the disinterested protection she is extending to us and will continue to extend to us. Don Segundo Arellano, Don Tiburcio del Rosario, Sergio Matias, Don Agapito Zialcita, Don Flaviano Alonzo, Don Mariano Legazpi, Don Jose Turiano Santiago y Acosta, Don Aurelio Tolentino, Don Felix Ferrer, Don Felipe Buencamino, Don Fernando Canon Faustino, (Hijo), Don Anastacio Pinzun, Don Timoteo Bernabe, Don Flaviano Rodriguez, Don Gavino (?) Masancay, Don Narciso Mayuga, Don Gregorio Villa, Don Luis Perez Tagle, Don Canuto Celestino, Don Marcos Jocson, Don Martin de los Reyes, Don Ciriaco Bausa, Don Manuel Santcs, Don Mariano Toribio, Don Gabriel Reyes, Don Hugo Lim, Don Emiliano Lim, Don Fausto Tinorio (? ), Don Rosendo Simon, Don Leon Tanjanque (? ), Don Gregorio Bonifacio, Don Manuel Salafranca, Don Simon Villareal, Don Calixto Lara, Don Buenaventura Toribio, Don Zacarias Fajardo, Don Florencio Manalo, Don Roman Gana, Don Marcelino Gomez, Don Valentin Polintan, Don Felix Polintan, Don Evaristo Dimalanta, Don Gregorio Alvarez, Don Sabas de Guzman, Don Esteban Francisco, Don Guido Yaptinchay, Don Mariano Rianzares Bautista, Don Francisco Arambulo, Don Antonio Gonzalez, Don Juan Arevalo, Don Ramon Delfino, Don Honorio Tiongco, Don Francisco del Rosario, Don Epifanio Saguil, Don Ladislao Afable Jose, Don Sixto Roldan, Don Luis de Lara, Don Marcelo Basa, Don Jose Medina, Don Epifanio Cirisia (? ), Don Pastor Lopez de Leon, Don Mariano de los Santos, Don Santiago Garcia, Don Claudio Tria Tirona, Don Estanislao Tria Tirona, Don Daniel Tria Tirona, Don Andres Tria Tirona, Don Carlos Tria Tirona, Don Sulpicio P. Antony, Don Epitacio Asuncion, Don Catalino Ramon, Don Juan Bordador, Don Jose del Rosario, Don Proceso Pulido, Don Jose Maria del Rosario, Don Ramon Magcamco (? ), Don Antonio Calingo, Don Pedro Mendiola, Don Estanislao Galinco, Don Numeriano Castillo, Don Federico Tomacruz, Don Teodoro Yatco, Don Ladislao Diwa (? ), Segundo Arellano, D. Tiburcio del Rosario, D. Sergio Matias, D. Agapito Zialcita, D. Flaviano Alonzo, D. Mariano Legaspi, D. Jose Auriano Santiago y Acosta, D. Aurelio Tolentino, D. Felix Ferrer, D. Felipe Buencamino, D. Fernando Canon Faustino, Jr., D. Anastacio Pinzon, D. Timoteo Bernabe, D. Flaviano Rodriguez, D. Gavino Masancay, D. Narciso Nayuga, D. Gregorio Villa, D. Luis Perez de Tagle, D. Canuto Celestino, D. Marcos Lacson, D. Martin de los Reyes, D. Ciriaco Bausa, D. Manuel Santos, D. Mariano Toribio, D. Gabriel Reyes, D. Hugo Sim, D. Emiliano Sim, D. Fausto Tirona, D. Rosendo Simon, D. Leon Tanjanque, D. Gregorio Bonifacio, D. Manuel Salfranca, D. Simon Villareal, D. Calisto Lara, D. Buenaventura Toribia, D. Zacarias Fajardo, D. Florencio Manalo, D. Roman Gana, D. Marcelino Gomez, D. Valentin Polintan, D. Felix Polintan, D. Evaristo Dimalanta, D. Gregorio Alvares, D. Sabas de Guzman, D. Estevan Francisco, D. Guido Yap-Finchay, D. Mariano Rianzares Bautista, D. Francisco Arambula, D. Antonio Gonzales, D. Juan Arevalo, D. Roman Delfino, D. Honorio Tionges, D. Francisco del Rosario, D. Epifanio Saguil, Don Ladislao Afable Jose, D. Sixto Roldan, D. Luis de Lara, D. Marcelo Basa, D. Jose Medina, D. Epifanio Cuisia, D. Pastor Lopez de Leon, D. Mariano de los Santos, D. Santiago Garcia, D. Claudio Tria Tirona, D. Andres Tria Tirona, D. Carlos Tria Tirona, D. Estanislao Tria Tirona, D. Daniel Tria Tirona, D. Sulpicio P. Antonio, D. Epitacio Asuncion, D. Catalino Ramon, D. Juan Bordadom, D. Jose del Rosario, D. Proceso Pulido, D. Jose Maria del Rosario, D. Ramon Magcauan, D. Antonio Calingo, D. Mendiola, D. Estanislao Calingo, D. Numeriano Castillo, D. Federico Tomacruz, D. Teodoro Pateo, D. Ladislao Diwa, and also the only foreigner, the North American subject, Mr. L. M. Johnson, Colonel of Artillery, who was present at the ceremony, to which act I certify. (Signed) AMBROSIO RIANZARES. (Also signed by) Mariano Trias, Artemio Ricarte y Vibora, Salvador Estrella, Baldomero Aguinaldo, Mariano Noriel, Pantaleon Garcia Estanislao Viniegra, Esteban San Juan, Felipe Topacio, Rufino Nata, the Captain of Artillery: Francisco Constante, Juan Cailles, Daniel Tirona, Hugo C. Area. and all swore solemnly to recognize it and defend it to the last drop of our blood. Who solemnly swear to recognize and defend it unto the last drop of their blood. In witness thereof, I certify that this Act of Declaration of Independence was signed by me and by all those here assembled including the only stranger who attended those proceedings, a citizen of the U.S.A., Mr. L. M. Johnson, a Coronel of Artillery. In witness whereof, I commit the proceedings to writing in this act, which is signed with me by all those concurring in this act, as well as by the only foreigner, a North American subject, Mr. L. M. Johnson, Colonel of Artillery, who attended the meeting, to all of which I certify.